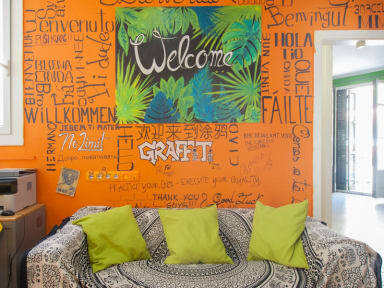 It isn’t clean, it isn’t quiet, it isn’t beautiful but it’s one of the best hostels I’ve ever stayed! The staff (that cooks dinner every night) nice and the vibe is what you expect in Spain: tranquilo! 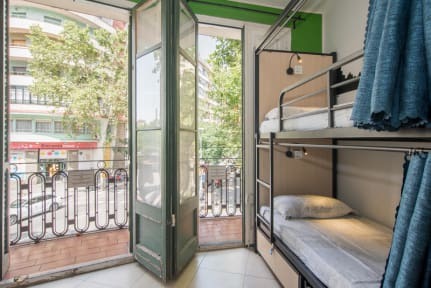 Had an great time here when I was looking for a room to rent in Barcelona. Felt like good temporarily home a couple of days! Nice place, bit on the expensive side, maybe sue to the holiday season. Sliep op een kamer met 6 stapelbedden, geen stopcontact bij het bed, geen nachtlampje en geen lockers bij het bed of überhaupt op de kamer.. Ook was het niet erg schoon en de bedden waren totaal niet comfortabel. Je kon de bodem voelen. De douches waren wel heerlijk!! Ook was het ontzettend fijn en gezellig dat er iedere avond een maaltijd klaar stond, waar je ‘gratis’ van mocht eten. Ik vind het bedrag wat ik moest betalen voor het hostel wel te hoog voor wat je krijgt. Really thought this would be a better hostel. Rooms are not so clean, bad locks and the sanitary is bad and not clean. Stole stuff out of the refrigerator. The matrasses are really really bad. The location is pretty okay. Supermarket downstairs and metro on walking distance. Way to expensive for the 2dorm room we got.